Welcome to Genergy Generators – the definative source for your backup electrical generator or engine needs. With engines, gen-sets, parts and service from Genergy, there’s a electric generator for you. Whether for main use, or use as a standby generator or emergency power generator, get the unit or engine you’re looking for with parts and service as well!! Genergy manufactures gasoline electric generator, 1500 RPM diesel generator and a complete range of professional machinery. Green-Product offers energy solutions more sustainable and respectful with the environment. Products that significantly reduce consumption and harmful emissions, and allow us to manage our energy more intelligently. Genergy generators, it should be noted, are rather less expensive than some other company’s generators. However, it comes with a longer warranty – two years total warranty – than many of its competitors, it is designed to work well with transfer switches (which are needed to prevent dangerous feedback into the power lines during an outage), and can provide direct current (DC) output for recharging batteries as well – all part of a compact, fairly light, and highly effective package. Electric generators are multifaceted and diverse and as a result, have many takers around the world. They can provide vital power for most emergency situations. The generators are available with different configurations and are categorized according to the manner in which they are used and the amount of power they are expected to generate. These machines can run on various fuels including diesel, gasoline, propane and even natural gas. Diesel generators are equipped with diesel engines for electricity generation. These generators are ideal for emergencies and locations that don’t have a power grid. They can also be used in tough conditions and sophisticated applications such as peak shaving (grid support to the power grid). Gensets of 8-30 KW power are ideal for homes, small shops and offices. Larger units are better suited for industrial use as well as hospitals, data centers and large office complexes. Electric generators are available in various sizes and thus, you should choose well to avoid low loads or power shortage. Your ideal generator should be capable of handling non linear loads as well. Having the correct electric generator needed for the job is crucial. For standby generators or emergency power generators, you may choose diesel, propane or natural gas powered gensets. This allows for a custom “fit” according to your specific individual needs. Find which electric generator best suits your needs. We have a great selection of industrial / home units for you to choose from. Is power outage causing a negative impact on your home or business? If so, it’s time you invested in a high quality backup or emergency power generators for uninterrupted power supply. 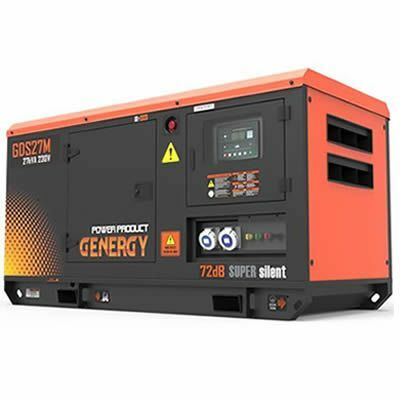 You can use the utility power provided by these generators to ensure smooth functioning of your business and boost your ability to meet customer demands. Blackouts are never fun. Losing electricity out of the blue can really put a damper on your plans. If you have guests over or are finishing some work on your computer, you definitely want to be able to continue working. This is why a lot of people today are purchasing portable generators. If you ask Spanish professionals about what generator performs best and lasts longest, you’ll probably get Genergy as an answer. Electric generators can be useful in a huge variety of circumstances. When an emergency comes up, for example, and general electric power is lost, having a good Genergy portable generator on hand can not only help you to stay comfortable, but can also save you a lot of trouble and expense as well. For example, powering a refrigerator or freezer can potentially preserve several hundred dollars worth of food – while if your furnace or heating system depends on electricity, then if you lose your power in the winter, a generator can prevent even more expense by keeping your pipes from freezing and bursting.